A bouncer has pleaded not guilty to illegally accessing CCTV footage of England rugby captain Mike Tindall with a woman in a bar in New Zealand. 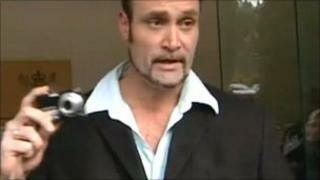 Jonathan Dixon, 40, was remanded on bail until 17 October at Queenstown District Court, a court spokesman said. Mr Dixon is accused of "accessing a computer system for dishonest purpose". The video appeared to show the woman kissing Tindall - married to Zara Phillips, the Queen's granddaughter - on the head. Tindall had been on a night out last month with his team-mates at Queenstown's Altitude Bar, following their previous day's World Cup win against Argentina. Mr Dixon is later alleged to have uploaded security camera footage on to the internet. Black and white stills showing Tindall and the woman apparently hugging and kissing were published in newspapers. Tindall, who married Zara Phillips in July, said he had gone straight back to the team hotel. However, the Mail on Sunday published further photos this weekend, which showed him in a second bar. The team's management defended the captain a second time. England manager Martin Johnson said any misleading information Tindall gave about his whereabouts that night was a simple mistake. "If he was inaccurate in his recollection of the events of the night and his specific whereabouts, he certainly didn't mean to mislead anyone. It was not an orchestrated cover-up," Johnson said. "It was simply an error on his behalf which he apologises for." This came as three of Tindall's teammates were reprimanded for making inappropriate comments to a female hotel worker in Dunedin. James Haskell, Dylan Hartley and Chris Ashton were made to formally apologise after reports they had humiliated Annabel Newton.